I don’t want to turn off any readers who really like dwelling on the negative, but here’s a statement of fact: There are only good things. And things is a very broad term. There are only good people, places, actions, activities, offers, plans and situations. There is no such thing as bad or evil. Part of living a simple, deliberate life is eliminating the religious, spiritual and societal clutter that has created a lot of silly nonsense in our belief systems. The idea of bad is clutter that should be swept away, vacuumed up or carted off. Here are two examples from my life that highlight how there’s only good. Have you noticed how So Much More Life has taken off since the first of the year? And my posts aren’t the only ones that are doing well. Take a look at the sidebar. When last I looked, two of the Most Popular Posts are guest posts. That’s amazing, isn’t it? That’s happened because of a convergence of good things. More good people like you are finding this blog. And I made a decision to write better, deeper posts. And I decided to ask you more often for your comments. Don’t you think that’s a good idea? A couple of kind bloggers have published guest posts by me, spreading my message. And a few great bloggers have accepted my invitation to guest post here. There’s a good principle at work here: To have what you desire, first make it true for someone else. That means if I give you good content and a nice forum in which to discuss it — and if I give away space here to anyone who wants to share a message — I find more of life’s good things coming to me. It’s the truth, and it’s working. Every moment of my life has been preparation for this one. I really believe that. But this moment has a number of challenges, most of them financial. You see, this successful blog doesn’t make any money — nor is it intended to. And my freelance writing career isn’t making as much money as I would like because the regular clients I have are paying too little (and getting scared because of recent changes by Google that have reduced their income) — and I have too few clients. My bookselling business isn’t generating a full-time income as it once did, partly because I’m having a problem finding inventory to list and sell. But there are only good things. With the help of the new writing clients I will soon find — maybe you know of some — my financial situation will go from good but unstable to good and getting greater. And my bookselling business will stabilize as I find more inventory to sell. I don’t expect any of my readers to help me find inventory for my bookselling business, but I suspect some of you know of writing opportunities. Because there are only good things in the world, I think it would be good to mention that the Writer For Hire section [section removed] of this site has been recently updated and that my writing status is GREEN — actively seeking new clients. Email me at gipplaster@earthlink.net if you know someone who could use the help of a good Internet content writer or ghost-blogger. To wrap up, I want to mention two more points about the deep vein of goodness that runs through the universe. 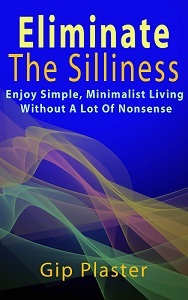 First, silliness and other forms of nonsense sometimes get between us and the good we should be experiencing. That stuff isn’t bad, it’s just misplaced, unnecessary or — uh, silly. Finally, I want to mention three rather jarring topics before someone else mentions them or something similar. They come up often when people suggest that evil doesn’t exist. Here they are: Hitler. AIDS. Sexual abuse. I’m happy to enter into a discussion about just how deep my belief in good goes. And those three terms don’t scare me or cause me to waver in the least. Take your best shot, if you must. But make it good. You see, I can write funny Texas-themed guest posts for other bloggers. And I can write tongue-in-cheek, mildly humorous posts about starting an uprising against paper usage. But I’m serious about some things. Ideas like bad and evil unnecessarily clutter up a world that was intended for simple, minimalist-minded people like us. I’m serious about the inherent goodness in everything. Hi Gip. I really like your positive attitude. I’m not going to argue with your take on there only being good in the world, because I agree with you. Even if we can’t always see it at the time, everything we experience is to our benefit and offers us personal and/or spiritual growth. I don’t think anything is inherently good or evil. It just is. Some of it we like, and some of it we don’t. Lots of things stand between us and the good at times, but we can make it go away in a variety of ways. In one way, saying that everything just is, is the same as saying it’s all good. Perspective plays a large role. Nice challenge there about seeing the good in everything. Looking at the unholy three, I can see good in all of them but it depends on your perspective. It’s similar to debating. You’re given a topic that you have to present and do it well. So yes it can be done. My Dad had some tough times during the war when Holland was invaded but even though he detested war and all of its ‘evils’, he still had some good things to say about it. Here’s to the good in all of us. I’ll join you in that. Here’s to the good! Thanks for being honest and sharing that side of you -the side that reveals that work isn’t so steady right now. I am in the same boat. But I believe that good things come to those who wait. And it’s nice to know that you share the same positive thinking in that aspect. I just tweeted about you and hope that you have some leads as a result of it. As for the topic about evil in this world, I had a debate with a friend where she didn’t believe there is evil. I told her that was a bunch of ‘kaka’ to say the least. Because I believe it’s from evil that all the suffering this world stems from. Suffering comes to from people stepping outside their life’s natural stream or allowing themselves to somehow be separate from the natural flow of goodness. It’s a temporary, reversible condition that happens to all of us from time to time and some people for very long times. You can’t judge a person or situation’s goodness based on how much or how long they’re separate from what’s best. There’s no evil, but there’s separateness. Happily tweeting for your good from a good place even though we are still walking out the less consistent than we’d like work thing, even that is good as it’s given us time to give a lot back, hone some skills and build community. I have to say I’m with Jenny Smythe on the evil thing though; while I believe that even a tragedy can be turned around and some good come out of it any parent losing a child to a drunk driver or to some sick individual that can’t control their own evil impulses will tell you bad things happen. That is part of life; the bigger part that you focus on is the positive perspective of looking for the good in anything. That same traumatized parent may become a foster parent later and change lives or become an advocate for the need for mental healthcare. Good can be brought out of bad. Thanks for being transparent and for reminding us to keep a good perspective in life! We have noticed your blog taking off and that is awesome!! Thanks to both you and Gena for tweeting about my work situation. I know it will help. You can’t be sure what the soul of a person who is killed is trying to accomplish, so you can’t label a death or killing as evil or bad. Some souls must make a rapid exit because they planned it that way or are needed for another purpose, depending on exactly how you believe. While sudden, traumatic events are certain to cause a distruption in the lives of everyone involved, they don’t have to ruin a life. Of course good can come out of an unwanted situation because there’s only good in it. You’ve made a few mentions of your spirituality lately and I think it’s great that you’re putting your beliefs out there. That takes guts. Sounds a similar philosophy to the guy who wrote “Conversations with God”, can’t remember his name. As far as work goes why don’t you register for http://www.guru.com? There are lots of very bad jobs on there but if you pick through them there are still some goodies to be had. I only started recently and still have managed to get a good contract. It really helps if you come from an English speaking country and some employers want only American writers. Good luck and if you want to know more email me. I may just email you. Neale Donald Walsch wrote Conversations with God, and yes, especially the part of making what you desire true in someone else’s life is lifted directly from CWG. Walsch isn’t right about everything and his writing get a little too details and far-fetched in places, but he’s definitely got the right idea. Thanks for the reminder. And I am sending positive vibes your way to get more work! Thanks for the postive vibes. There’s a whole other spiritual discussion about vibrational energy just waiting to happen. Only good things, now and always. Love your positive attitude. I don’t know if I look at everything as good, but I do look at everything as a lesson. I’ve learned from the good and not so good situations in my life. In the long run, I think it’s made me a better person. Thanks for your comment, Felicia. I don’t comment often on your blog, but I do read every post. You do a great job of mixing inspiration, practical advice and personal stories. Interesting viewpoint, Gip. I believe that good and evil exists – that both can come your way, to a lesser or greater degree. If something bad happens, you can choose your response. Have to agree with Felicia, there’s a lesson in everything. Question is, are you teachable? Hi Gip – I’m here through the link at Felicia’s blog. Thanks for joining the conversation here — and for your comments. I hope to see more comments from you in the coming weeks. I appreciate your good wishes! A family friend aged 80 had his face between my legs when I was five…… my father also did such things…. and worse…… is that not evil? I don’t understand. No, it isn’t evil. People who do things like that are good people who’ve separated themselves from the flow of good things in their lives. By doing it, they attempt to temporarily separate you from the flow of good as well, and it sounds like they were successful. Until we start thinking of people who harm us as the amazingly wonderful creatures that they really are, we can’t heal from any perceived damage they inflict.